Posted on 07/11/2013 Can a Personal Injury Lawyer Help after an Amputation Injury from an Accident in Florida? You may have been diagnosed with some sort of spinal injury and not understand what it all means. Many of the terms used to classify an injury are used interchangeably, only adding to the confusion. Here is a simple breakdown of common diagnoses and what they mean. An intervertebral disc, or more simply a disc, is essentially a shock absorber for the spine. Between each vertebrae, there lies a disc made up of jelly like fluid on the inside and a harder shell to encase the fluid. The disc squishes upon impact to protect the vertebrae from breaking. Intervertebral discs are often damaged in traumatic accidents resulting in long term consequences. Spinal disc herniation can be one of the more confusing diagnoses for spinal injuries because it is referred to by many names, ie. slipped disc, ruptured disc, extruded disc, herniated nucleus pulposus (HNP). It occurs when the outer cover of the disc, called the annulus fibrosis, tears permitting the disc fluid to be pushed out or extruded. Herniations usually only affect a small part of the disc. In very mild cases of herniated discs, there may be no noticeable symptoms whatsoever. In others, the fluid irritates nearby nerves and causes pain that manifests itself at the location of the disc or in another part of the body, depending on which disc and nerve is damaged. The process of the sensation traveling to a remote part of the body despite the injury located along the spinal cord or nerve is called innervation. When the disc fluid leaks it may come into contact with a nearby nerve, sometimes called a nerve root, and may cause pain and weakness to the nerve. Where the pain and weakness is experienced is based on what is called innervations or the distribution pattern of the nerve (where and what it controls). In extreme cases, the disc fluid can compress the entire cauda equina, which if untreated, can result in permanent loss of sensation in parts of the legs, incontinence or severe pain. Certain people are more prone to herniated discs. People with excess body weight put extra stress on their disks in the lumbar region and are more likely to experience a herniation that will lead to pain. Jobs that are physically demanding, those requiring frequent heavy lifting, pushing, pulling, put people at greater risk for herniation because of the extra stain on the spine and back muscles. A bulging disc occurs when a disc within the spine expands in size and bulges out beyond its normal location. It does not tear, as a herniated disc would, but instead remains swollen and extended while pressure from the inside of the disc presses on the outer layer. Many people have bulging discs without even realizing there is a problem. It is often considered a normal part of aging when it develops over time. Bulging discs are not normal in younger people and when they develop after a traumatic injury to the back. 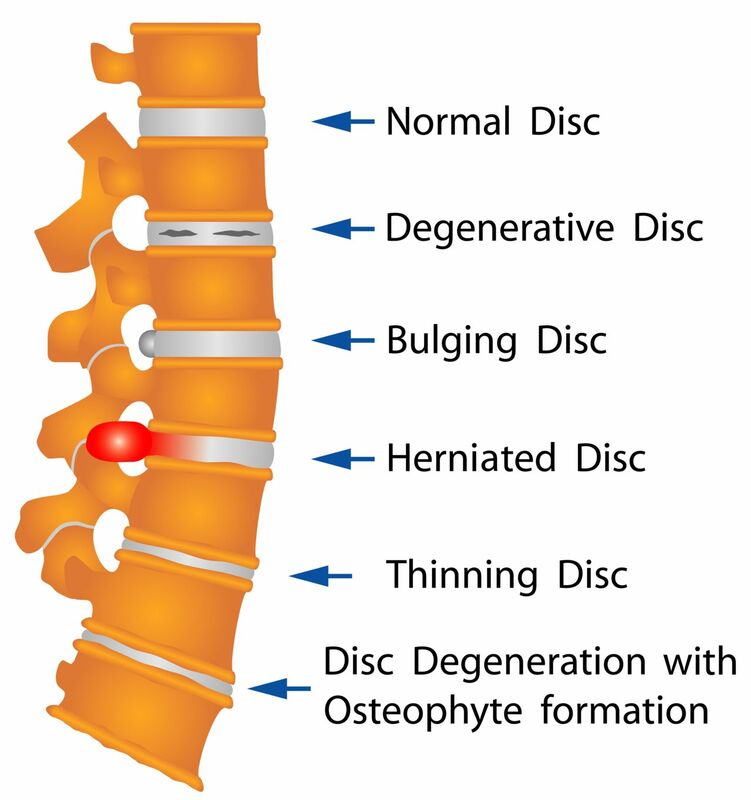 The pain associated with bulging discs stems from the disc extending beyond the bounds of where it belongs and exerting pressure on the nerves or spinal cord. Surgery is rarely needed, but can be used to remove bulging discs causing persistent pain. In severe cases, especially with certain herniated discs, large portions of the vertebrae and discs must be removed and fusion of the remaining vertebrae is used to stabilize the spine. Spinal stenosis is a condition in which the open space in the spine that houses the spinal cord, known as the spinal canal or spinal channel, becomes narrower. As the spinal canal narrows, the bones put pressure on the spinal cord and nerves, which can cause radiating pain, numbness, bladder problems, loss of function, and weakness in certain limbs or muscles as a result of the spinal cord compression. Spinal Stenosis is often considered a degenerative condition (it develops with age) and is most often seen in people over 50 years old, but it can also occur as a result of trauma to the spine, such as one might experience in a motor vehicle accident or serious fall. Other injuries to the spine, like disc herniations and vertebrae fractures, can damage the spinal canal and lead to stenosis in anyone, including young adults and children. The narrowing of the spine may occur at different places but is most common in the cervical and lumbar areas where the spine is more susceptible to damage. Like other nerve damage, the location of the pain and side effects signal to the doctors where the spine is touching the nerves or spinal cord. Compression fractures are most often associated with people who have osteoporosis or bone cancer because weak and brittle bones are more prone to fracture. However, they can happen to anyone who experiences a hard fall, serious vehicle accident, or other back injury. Vertebral compression fractures can be classified as crush, wedge or burst fractures. Crush fractures occur when an entire bone or vertebra breaks. The bone collapses into itself and crushes the lower part as a result of force applied horizontally to the spine. Crush fractures are relatively stable and may heal on their own with proper care and rest. Wedge fractures occur when the front of the vertebra collapses but the back remains intact, leaving a wedge or triangular shaped bone. These are the most common types of spinal fractures because the front of the spine is less stable than the back part of the spine. Wedge fractures are more stable than burst fractures but can lead to Kyphosis (severe rounding of the upper back, often referred to as hunchback) and other spinal deformities. 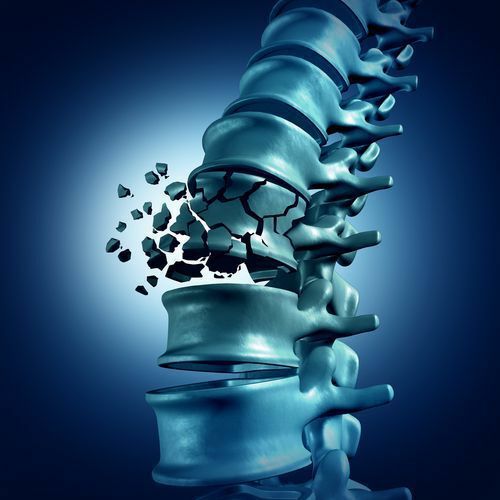 Burst fractures occur when the vertebra shatters in multiple places and broken pieces are forced out into the nearby spinal tissues and nerves. These are the most serious spinal fractures because they are highly unstable and can cause permanent damage to the spinal cord. Burst fractures are likely to continue changing and worsening with time if not treated. Immediate medical care is recommended to prevent worsening of the fracture. The thoracic and lumbar regions of the spine are more likely to fracture than the cervical region of the spine because they support more weight and are subject to more vertical pressure. Common treatment includes limiting both movement and weight lifting, wearing a back brace, taking bone strengthening medications and, in the most severe cases, surgeries to remove bone fragments and enhance spinal support internally. It is worth noting that spinal surgeries are not a quick fix and often require follow up surgeries over time. Nerves run from the base of the brain down the spine and through the rest of the body, sending signals back and forth. 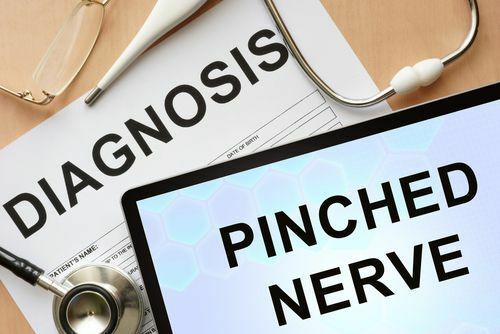 A pinched nerve is caused by increased pressure around a nerve that compresses the nerve. It can be a harmless result of sleeping on a bent arm, crossing legs or repetitive motions like typing. It is often described as a limb ‘falling asleep’ or tingling for a few moments and then the sensation passing. When a nerve is compressed as a result of a bulging disc, herniated disc or bone spur, the sensation does not fade away. Treatment of a pinched nerve is largely dependent upon the location of the nerve. Special exercises and stretches may be used to strengthen muscles and relieve pressure on the nerves. Anti-inflammatory medications are also commonly prescribed to reduce the swelling of an area and irritation of the nerve. Surgery may be required in severe cases where other forms of treatment are ineffective. It is possible to develop compression fractures, spinal cord injuries, whiplash, herniated discs, sciatica and other injuries to the back after a serious accident. Any pain in the back after an accident should be evaluated by a doctor as soon as possible to prevent permanent damage and treat existing injuries. If you've been injured in an accident you should contact an experienced personal injury lawyer as soon as possible. Please contact us online or call our office directly at 727.446.0840 to schedule your free consultation.